Muscular and beautifully engineered, the Audi S5 proves it's about more than fashion and desirability by providing a dynamic and exciting drive. 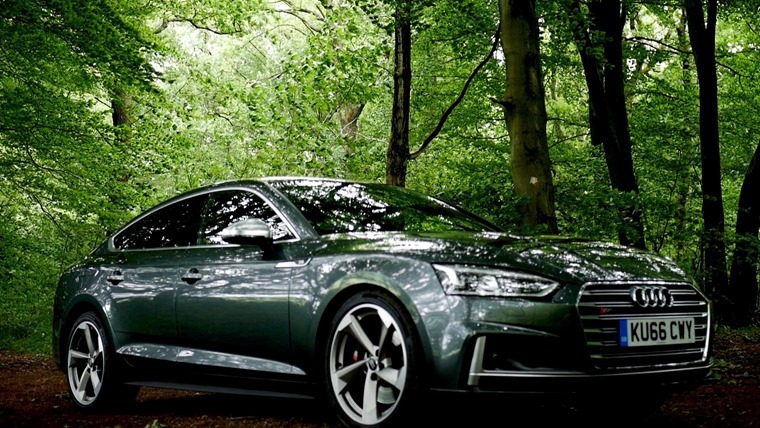 Having previously reviewed the Audi A5 and more recently the A5 cabriolet on site, Howard Ritchie decided to take our love of all things vorsprung durch technik a step further by opting to review the S5 Sportback aka the high-performance variant of Audi's A5 range. The appearance of the new S5 Sportback follows the traditional form of Audi S models - subtle yet appropriately brawny, drawing upon a new V6 turbocharged engine to deliver between 1,370 to 4,500 rpm. From rest, it will blast past 62mph in only 4.7 seconds and can reach a limited top speed of 155mph. Inside, the S5 Sportback shares a similar set up to the A5, and the cabin reflects the kind of quality we have come to expect from Audi. The cockpit brings with it various options including free-text search and instrument dials, all displayed on a high-res 12.3 inch monitor and all of which Howard ably demonstrates in search of every supermarket you can think of. The S5 naturally features Quattro as standard, with wheel selective torque control as well as an eight-speed tiptronic transmission allowing drivers to freewheel for further efficiency gains between 34 and 99mph when they ease off the accelerator. Enjoy the review and let us know what you think. Do your S’s look like 5’s too?